If you want to rejuvenate, brighten and illuminate your skin, come for one of the specialised skin treatments or one of the most relaxing and effective professional facials Durbanville clients have ever experienced, at Pure Day Spa. We use only the best internationally renowned and professional products such as Nimue to do our facial treatments. Our therapists will assist you in choosing the perfect facial for your specific skin type, ensuring that you will leave our spa with youthful, glowing skin. We also offer gift vouchers for our facial treatments. Rejuvenate, brighten and illuminate your skin with our specialized skin treatments. With us, you are getting one of the best facials available, and you will also receive a complimentary brow shape or brow tint on request. Pure Day Spa is known as being the provider of the best facials Durbanville clients have ever experienced, and our selection is comprehensive. We offer both basic and advanced Nimue facials to both teenagers and adults, who want to improve the overall appearance of their skin or combat skin issues. One of the advanced treatments we offer is the Nimue 7.5% TCA, which offers clients stunning end results, with a more radiant, smoother skin texture as well as the lightening of pigmentation. 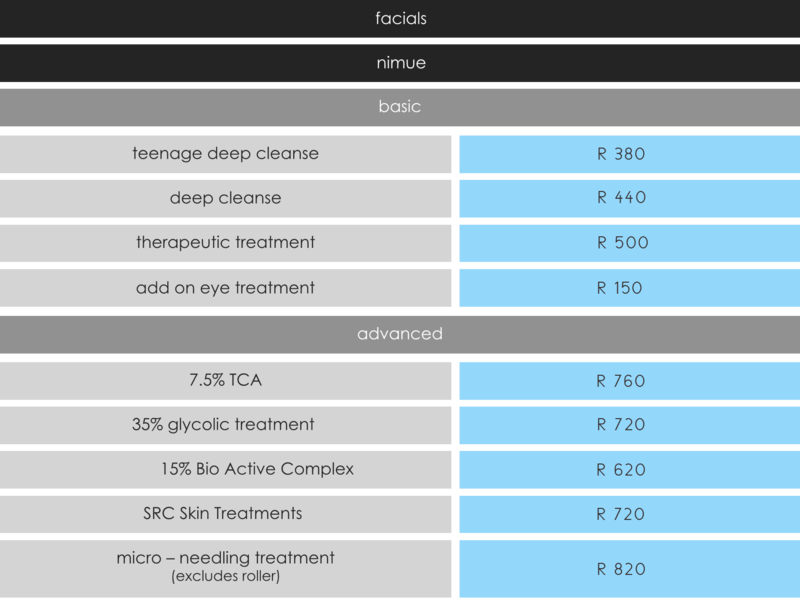 The Teenage Deep Cleanse facial we offer is perfect for girls who are planning on looking their best for their Matric Dance, as it cleanses, tones, and exfoliates, leaving skin looking and feeling fresh and dewy. We strive to maintain a high quality standard with every facial our clients receive, and so only make use of the absolute best products on the market – Nimue. Our therapists are highly qualified and trained, and so can provide unique treatments, such as the popular micro-needling treatment, which produce microscopic channels, perfect for the deep penetration of the excellent trans dermal solutions (TDS). This treatment also stimulates the production of new collagen in the skin, restoring the youthful plumpness of the skin. 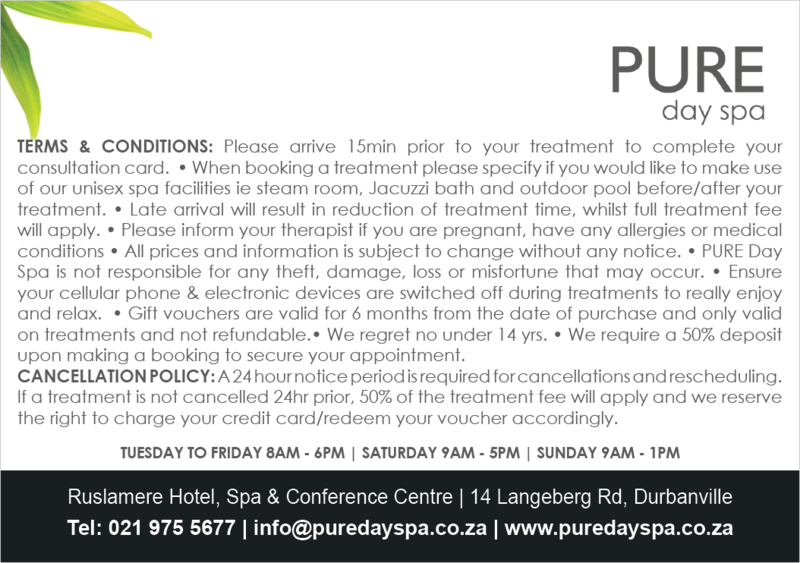 Visit Pure Day Spa for an effective and relaxing facial before a special event, or simply because you feel like it!